The following Pro-Life Training information is posted with permission from Pastor Dewey Moede of FGGAM.org. We have added “related Articles,” after this announcement. Bud and Tara are working to organize a constant peaceful and prayerful presence at local abortion clinics and several other proven strategies, in an effort to end abortion in New Mexico. They are also reaching out to the Christian community to educate, activate, and encourage them to stand for life. Our ministry is Christ centered and grace filled. There are many ways to get involved, our prayer is that you will join us in our life saving ministry. SURVIVORS & PROJECT DEFENDING LIFE are teaming up to bring YOU the FIRST-EVER NEW MEXICO ProLife Training Conference in Albuquerque! This FREE Conference will be hosted at August 2nd-4th. The ProLife Training Conference will include, exclusive workshops and training sessions by experienced Pro-life leaders from across the nation that will help build your confidence in standing for life. Topics Include: Why Pro-Life?, Defending the pro-life position, Sidewalk Counseling, Legal Rights, and much more. All are welcome. 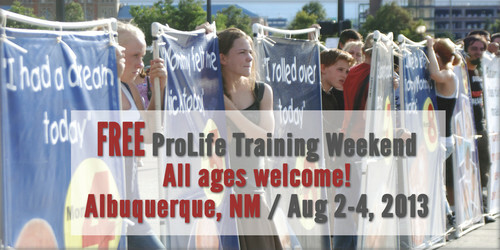 We are going to be joined in ABQ by: Operation Rescue, Students for Life, Priests for Life, Stand True and many others. Join us and let’s make history together by ending the injustice of our generation…ABORTION! Speakers include: Troy Newman: Operation Rescue, Cheryl Sullenger: Operation Rescue, Fr. Stephen Imbarrato, Project Defending Life, Jeff White: Survivors, Kristina Garza: Survivors, Brendon O’ Morchoe: Students For Life of America, Jason Walsh: Executive Director of Arizona Right To Life…with more national speakers yet to be confirmed!